Green Pond High’s attacking player Tyrone McLary (R) is caught in a fierce midfield battle with his Herbert Morrison Technical High opponent, Jammie Collins, during their crucial match-up in the St. James FA Sandals Resorts International Under-17 competition at the UDC field. Green Pond won the clash 2-0 to book their spot in the semi-finals. 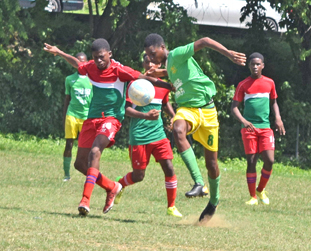 The semi-finalists in this year’s St. James FA Sandals Resorts International Under-17/Under-20 Football Leagues have been decided following the decisive round of games in the preliminary round played at the start of the weekend. MoBay City, Paradise, Granville and defending champions Green Pond, are the teams down to battle in the Under-17 Division with Heights, Bogue, Spot Valley, guest team Petersfield, and Lane with an outside chance, the teams challenging for a last four spot in the Under-20 section. A double header at the UDC field beginning at 2 p.m. today (Monday) will decide the competition’s finalists. In the Under -17 Division, MoBay City are down to face Paradise in the opening game before Green Pond opposing Granville. Talent-packed but unpredictable Granville sneaked through to the last four and earned a showdown with the slick-passing defending champions Green Pond, after Herbert Morrison Technical High (HMTHS) suffered defeat to the former in the final preliminary round match at UDC on Thursday. Second half goals from substitute winger Chevaughn Duncan and Simon Collins did the business as Green Pond blanked ‘Compre’ 2-0. After a tough early first half for the champions, which saw them labouring against an unflattering ‘Compre’ side, the Gregory Daley-coached Green Pond final made the breakthough seconds before the hour mark, when Duncan forced the ball into the back of the net. Nine minutes later, Green Pond made the points safe when a determined Collins got his name on the scoresheet with a well-taken strike from inside the penalty area, benefitting from a loose ball. Green Pond, with an unblemished and remaining on course to retain their title, finished top of the six-team standings with 15 points, three clear of MoBay City (12).